This statement is the primary reason that Roman Catholic Christians give such high regard to Mary, the mother of Jesus. The situation was obviously a terrifying one. Engaged to be married and met by an angel who gives word of her pending motherhood. Surely no one would believe the story of an angel’s message of her conception of a child. Would they? But Mary had another concern on her mind as well. Her people, the Jews, had been under the rule of foreign government for generations. Constant fear that she and her people would no longer be given freedom to worship God drove her and her people to a breaking point. Unending rebellions against the foreign rulers threatened the lives of Mary and those she loved. When would the foreign armies grow weary of petty rebellions and put an end to them once and for all? But surely they could not endure the persecution of the foreigners any longer? “He has brought down rulers from their thrones but has lifted up the humble. Our lives are filled with a constant struggle between simply enduring the hardships of life and taking matters into our own hands. If we do the former, we are prone to grow ambivalent or angry. If we do the latter, we are likely to become as unjust as the forces which come against us. 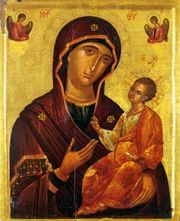 Mary accepts Christ into herself and avoids the conflict altogether by allowing God the prerogative to resolve the conflict according to God’s just ways. Do we really trust that the way of Jesus is the best way? For Mary it included watching the son she had raised die a horrific death on a cross. But it also meant she got to experience Jesus’ resurrection and the beginnings of a worldwide movement of peace and power.